Smooch let out her unmistakeable it's-a-coyote bark early Tuesday morning, so I grabbed my camera and headed for the door. I couldn't see the object of her attention, but I knew better than to dismiss the warning. A coyote was out there somewhere – I just had to find my glasses and look harder. I spotted Mr. Coyote out the bedroom window. He was a big one with a most magnificent tail. He soon met up with a smaller companion, whom I assume is his wife. Mrs. Coyote: Hens at 2:00! Mr. Coyote: You stay here and keep an eye on them. I'll circle around and see if we've got a clear shot. Me: Dream on, Mr. Coyote. I'll shoot you with more than my camera if you go after my hens. Smooch: Intruders! Interlopers! Trespassers! Get off of my property this very instant! 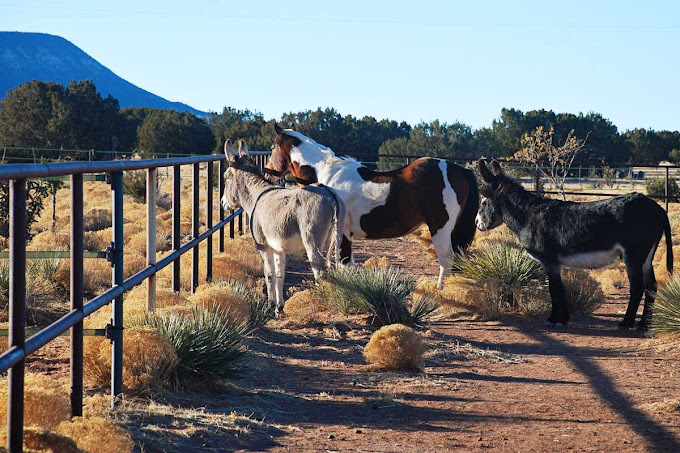 Smooch: Where in the hell are those burros when I need them? Alan and George had their heads buried in the hay tub but finally looked up and came to Smooch's aid. 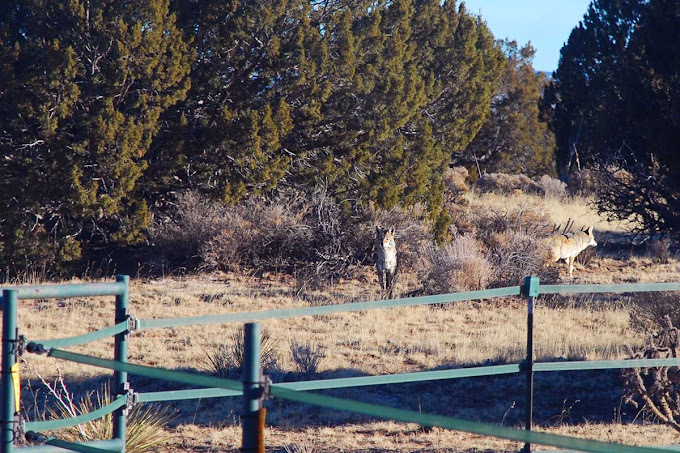 The triple stare-down – and Smooch's incessant barking – apparently were enough to send Mr. and Mrs. Coyote packing. I would have walked out further to check, but I failed to grab a pair of shoes when I went to find my glasses. Quite an account of this adventure, and you can sure tell that Smooch is *issed! I'm glad to hear I am not the only one never prepared for the outdoors when it's needed. Yep, about the time I gather up what I need there is no urgency anymore! Ah, glasses. The curse of anyone over 40. We ended up putting pairs of reading glasses in just about every room. And then I moved to prescription glasses and now I couldn't see without them. What a good bunch of critters! Good to see the coyotes are fat and fluffy; it must mean all is well in the environment. I hope Peach and Clara properly expressed their gratitude for having been saved from being eaten. What good burros! 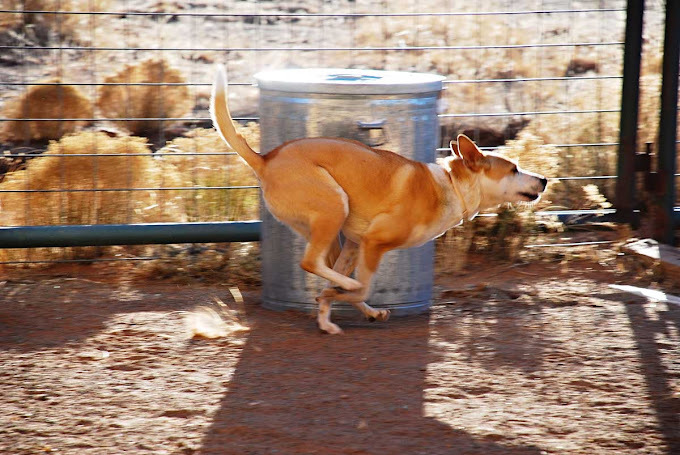 Do they naturally chase coyotes? 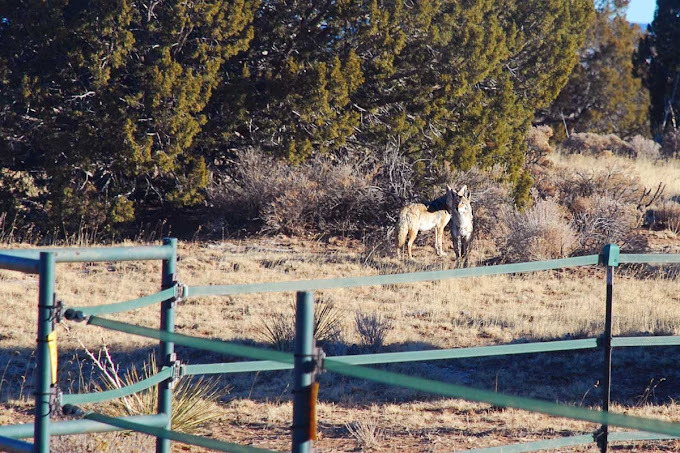 Seeing as how I have zero experience of living your kind of life, I'm amazed (in a good way) to see the stuff that happens on your ranch :) So coyotes are scared of burros and horses, or maybe it's just the collective commotion they made? Whatever it is, I'm sure the hens are grateful! I'm sure the girls(hens) appreciate the security guards at their disposal. Pretty coyotes though even if they were looking for hot lunch. Oh wow! Looks like exciting times at the Ranch. I didn't realize that the burros and horse would react to the coyotes as well. Thanks for telling such excellent stories (and I'm glad that no one got eaten). I have the same problem with my glasses- a GPS sounds like a great idea! That photo of Smooch in full flight is amazing! 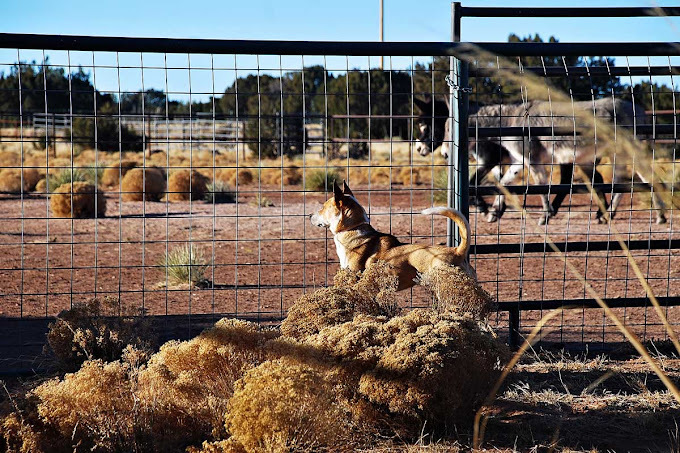 There are some farms in Canada that raise standard donkeys specifically to guard against coyotes. Love these pics! That's a beautiful pair of coyotes there. They are surely looking for a meal. 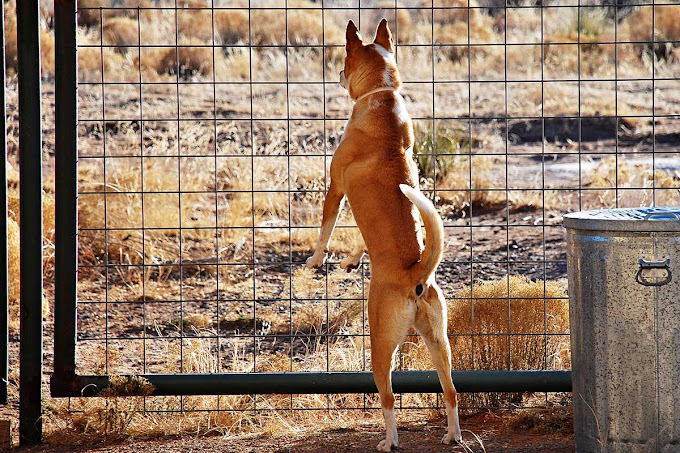 I know what you mean, my dogs do the "coyote" bark almost every morning and I see them just like this, out back slinking around. Smooch is an awesome security guard. 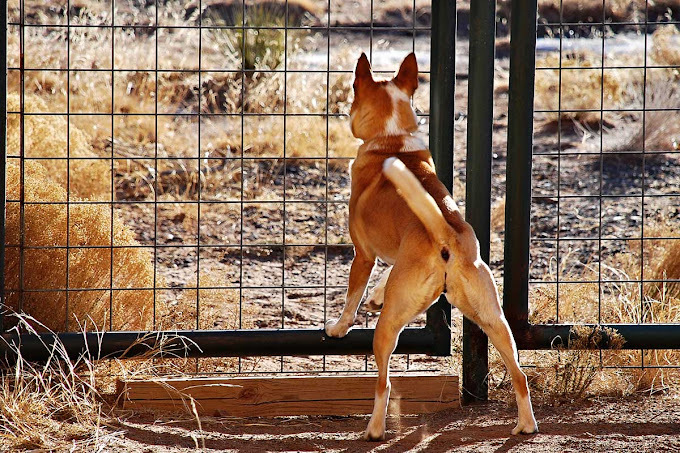 It must be so frustrating for her to be behind a fence when she sees a threat like that beyond her reach. Glad to see the rest of the herd rose to the occasion, too. Ooooh, I *love* a security team that works well together! What awesome shots of Smooch - her body language is so intense (and intent) - that's a gal who takes her job very seriously! The suspense, the drama, the whole story with awesome pictures. Good job Smooch and to the burro boys (even though a little late as far as Smooch was concerned). Thanks for bringing us along! 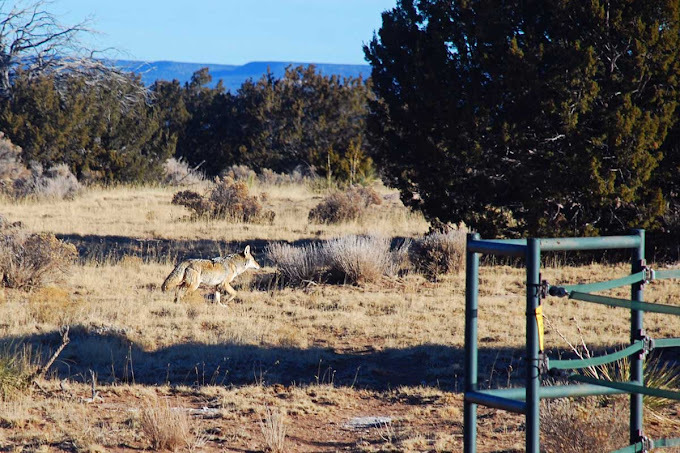 I know I will be damned in NM for thinking coyotes are awesome, right? I even bought a gorgeous photograph from a professional last summer at our farmer's market and then thought, yikes, will I be able to hang that in my house in NM? Thanks for the early morning beauty and am glad Smooch was on patrol so the big guys could lounge around the hay tub! Little buggers. I'm still mad at the coyotes in my area. I'm pretty sure they made off with one of my favorite kittys a few months back. We have coyotes in Cleveland,now, and I love it when I see them in the backyard. One did get in a fight with my dog, but I was able to break it up by yelling and chasing after it. I think we were close to a den, and we quit walking that way for a few months. My dog was also attacked by deer, twice, when she got too close to a newborn. You don't need to live on a ranch to have exciting times with wildlife, but here, we can't have donkeys to protect us! "Where the hell are those burros when I need them?" I must say that myself at least 15 times a day and I don't even own any. What a thrilling story with great photos! Running Smooch seems to get ahead of herself. Nothing like a dog with a good bark. That's why I have my two girls. I live down a long driveway and if my girls bark, I look to see what it is. Coyotes are a very rare critter in my parts (Wash, DC suburb), but we do have them. We have many more foxes, and my dogs sound the alert any time one is near. I can only imagine how bonkers they would go if they sighted/scented a coyote! Loved the way the burros came to defend their chicken sisters, of course with Smooch's help! I solved my missing glasses problem....I bought about FOUR pairs...keep one in the car, one in my purse, one in the bathroom, and one who knows where! Love your blog!! We visited my sister-in-law there in Bernalillo in 2008...FELL IN LOVE WITH THE AREA! Waiting for the boys to graduate high school....then who knows, we may be close neighbors!! Smooch is a great guard dog! The coyotes around my placw have been looking pretty fluffy here too...but our rabbit population sure doesn't seem any smaller. Our mini-donk chases any coyote that has the nerve to step into his territory! You always capture such wonderful, CLEAR photos! Thanks for sharing. Love, love, love Smooch. She is worth her weight in gold! Thanks for sharing. You do know that I'm living my dream life thru your photo's, right? glad you have Smooch to protect you :) Smooch, you go girl!! Coyotes look like they are keeping down the rodent population really well. A big trapping effort around my dad's place in the East mountains led to a huge explosion of pack rats and mice. Given the condition of those two, it looks like they are keeping to their work, even without hens. In England a good number of farmers keep Llama among their sheep to deter foxes, and it works a treat! I wonder if it would work on Coyote too?